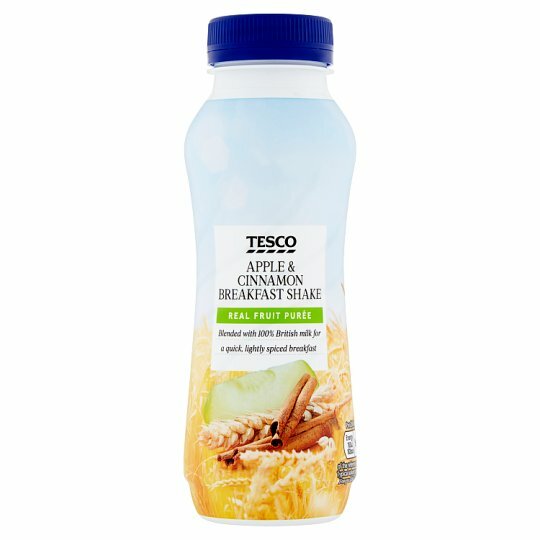 No added sugar Apple and cinnamon flavoured breakfast milk drink with sweetener and with added vitamins and iron. REAL FRUIT PUREE Blended with 100% British milk for a quick, lightly spiced breakfast Our breakfast drinks are made using only the best ingredients for both new and classic flavour combinations, carefully selected by our partners in Somerset. INGREDIENTS: Whole Milk, Water, Wheat Fibre, Milk Proteins, Apple Purée (1%), Malted Wheat Flour, Flavourings, Acidity Regulator (Trisodium Citrate), Stabilisers (Gellan Gum, Carrageenan), Sweetener (Sucralose), Colours (Beta-Carotene, Curcumin), Niacin, Iron, Riboflavin, Thiamin, Folic Acid. Once opened, keep refrigerated and consume within 3 days. Store in a cool dry place. Best served chilled. Shake well before opening and pouring.